Tottenham have enjoyed an underwhelming start to the new season. A 2-0 gift over Newcastle on the opening weekend courtesy of Jonjo Shelvey at St James Park was soon cancelled out by two lacklustre performances at the home of English football. The first home game saw last season’s top two clash, but Mauricio Pochettino’s side suffered defeat after a Marcus Alonso double resulting in a 2-1 win for the champions. Spurs looked to bounce back against an improving Burnley, but the Clarets proved stubborn and grabbed an injury time equaliser through their record signing – New Zealand striker Chris Wood. This left Pochettino frustrated and left to grapple with a big question; what to do about the Wembley curse. One reason Spurs supporters believe their side can’t win at Wembley is down to the size of the pitch. The Wembley pitch is five metres longer and two metres wider than White Hart Lane. The pitch there was the second smallest in the league – with Stoke City’s ground being the smallest. And it shows. The players are clearly more used to playing on a smaller pitch, and are struggling to cope with how much more space there is – compared to what they’re used to. Pochettino has brought a pressing philosophy to Tottenham Hotspur since becoming manager at the North London club back in 2014. This pressing style of play though is difficult on the Wembley pitch, and is why many fans feel they’re not winning their home games. If Spurs want to win the title this season, they need to sort their home form, and by doing that, Pochettino needs to accustom his team to the Wembley pitch, they need to practice on it more, and get used to the size. If they can manage this – they may find a cure to the ‘curse’. But this is a long-standing problem. Tottenham have a terrible record at the new Wembley. Since it’s opening in 2007, Spurs have a win percentage of 16 per cent, playing 12 games there, winning just two. And to make matters worse, the Premier league side that has the best record at Wembley is none other than their North London enemy Arsenal. Arsene Wenger’s side has won seven out of nine matches at New Wembley, a win percentage of 77 per cent. Tottenham’s style of play could very well be one of the reasons behind their Wembley ‘jinx’, but one other cause that many Tottenham supporters are pointing out could be the lack of atmosphere inside the stadium. 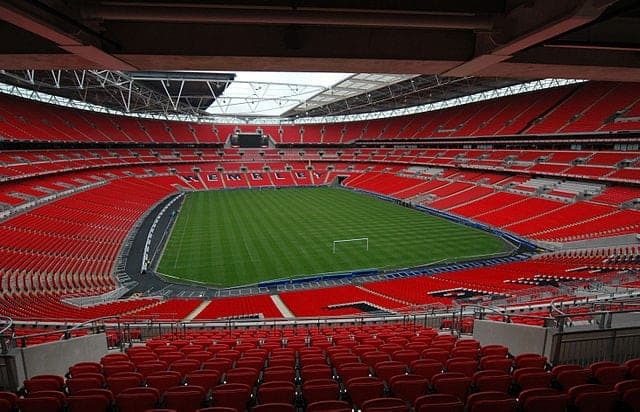 Wembley seats around 45,000 more seats than at White Hart Lane. Filling all 90,000 seats was never going to be likely, and with a much larger stadium there was always going to be less of a home feel this season. White Hart Lane did have an intimidating atmosphere, which many Premier League sides struggled to deal with. Wembley doesn’t have the same daunting feel to it, meaning the away clubs feel less pressure when they play against Spurs now, resulting in better performances, and worse performances from the North London club. If the Spurs faithful want their team to challenge this year, they need to get more supporters in this season, and create a more intimidating feel to Wembley – if they manage this, rival clubs will not look forward to Tottenham away. Results often don’t go teams way in football if they’re psychologically not right. This ‘curse’ that Tottenham seem to have physiologically can’t be boosting their confidence. The players will probably be feeling huge amounts of pressure every time they go out onto the Wembley pitch. Before all the hype of this ‘curse’ was pointed out, Spurs would have felt confident they could get the results. Now though – not as much. The players have no confidence; rival sides will come to Wembley extremely confident of winning. Having the belief of knowing you can win makes such a huge difference in sport. With Pochettino’s side right now – they don’t have that belief. Pochettino has been a very successful manager in the Premier League so far, but he needs to sort out his side’s confidence. The Argentine needs to create a winning feel to his team when they play at Wembley. If he doesn’t restore some confidence, Spurs supporters may find their team’s ‘jinx’ at Wembley continuing throughout the season. Previous PostWho is Kubrat Pulev? This getting ridiculous. The team simply needs to perform. These pitch excuses are not good enough. First, Wembley is 105 m by 69 m. WHL was 100 m by 67 m. Big deal. These are supposed to be professional footballers. When Spurs were a great cup side the Wembley pitch did not seem to cause any problems. Second, if pitch size matters that much, each PL team would lose all their away games. Utter nonsense. They need to shape up and get on with it. Some are not turning up. Bollox! They have made the pitch at Hotspur Way exactly the size as Wembley and that’s what they train on every day, so 5 meters more has nothing to do with it. We also get 60/70,000+ to every game. Chelski got lucky as did Burnley, NOTHING more. An article full of dubious argument and cheap psychology. As has been said above, the size of the pitch has nothing to do with anything: I think its 15 Prem teams have pitches the same size as Wembley, so that argument doesn’t hold water for a minute. The loss to Chelsea was unlucky, the draw with Burnley was a late smash-and-grab, the 2 wins in 12 games were all finals, semi-finals or Champions League fixtures – hardly easy games to win. So the answer to the problem is “…to practice on it more…” is it? Spectacular lack of knowledge about football.